You are here: Home » Learn & Live the Faith » Catechesis » Do You Have Access to Both Forms of the Mass? Do You Have Access to Both Forms of the Mass? Did you know that our Holy Father wants you to have access to both forms of the Roman Rite Mass? Most Gen X and Gen Y Catholics only know one form of the Mass, but two forms are in use today: the Pauline (after Pope Paul VI) Usage or Ordinary Form (Novus Ordo or “Vatican Two Mass”), and the Johannine (after Blessed Pope John XXIII) Usage or Extraordinary Form (Usus antiquior, “Old Mass” or “Tridentine Mass”). 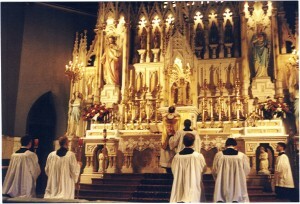 When I first became Catholic in the year 2000, it was hard to find a Tridentine Mass. In fact, you could be suspected of heresy if you cared too much about locating one. Now, the pendulum is swinging. The Pope’s Motu Proprio, called Summorum Pontificum, issued in July 2007, and the subsequent 2011 Instruction on its proper implementation promote both Masses. c. promoting reconciliation within the Church. While the Pope’s efforts are often reported, and quickly dismissed as an effort to prevent the schism of such groups as the Society of Saint Pius X, it is really more complicated than that. Some of the Holy Father’s insights can be found in this letter that accompanied the Motu Propio. The Canons Regular of St. John Cantius, an order in Chicago, Illinois, celebrated both Masses before the Motu Propio. Their founder, Fr. Frank Phillips, said, “Years ago in the initial formation of our community, I happened to meet ‘Cardinal’ Ratzinger and briefly spoke to him about our charism and he said – not exact words – ‘finally a community that does both.’” This order desires to “Restore the Sacred” and seeks to nurture a continuing renewal of the Christian life as fed by the liturgy. I visited the Canonry of St. Leopold in Long Island, New York to talk to them about these developments. They are a new foundation of the Canons Regular of St. Augustine, a very old order in Europe. Their Prior, Fr. Daniel Nash, said, “We give everyone a little bit of everything. We want to open the treasury of the Church, so people get everything that is theirs….not just what has been on the common market for the past 40 years.” Fr. Elias Carr said that it should be “normal” for both Masses to be available, and believes that when the Pope’s words are really heard, this is the direction we’re being led in. Yet, after all of the interviews I did to understand this new phenomenon, I noticed some resistance. Some religious orders view this shift as a calling for some to embrace, and not others. Some Catholic media people I’ve spoken with view too much emphasis on liturgy as misguided. Liturgical renewal, they say, won’t solve all of the problems in the Church, so the emphasis doesn’t quite make sense to them. Truth be told, I’ve only been to one Tridentine Mass in my life. They are hard to find. Even so, it’s an option and freedom that I appreciate having. For me, faith is about communing with God, and frankly, some of the drumming and guitar strumming at modern, suburban Masses doesn’t help me do that. If I ever reach an impasse where I can’t escape the contemporary music, I could always go Tridentine!